What Does it Mean When a Turtle Sheds? Like many other reptiles, turtles shed -- but unlike snakes or geckos, they aren't shedding their skin. While he never actually leaves his shell, which is permanently fused to the rest of his body, a turtle may shed pieces of it periodically. This depends on the type of turtle and his health, because shell shedding is typically a response to potential health risks. The outside of a turtle's body includes skin, which covers his legs, head and tail, and the shell that protects the bulk of his body. While the shell is made out of bones -- about 60 in all -- the outside is layered in plate-like scales called scutes. Made from an organic compound similar to what makes our fingernails, the scutes protect the bones and cartilage of the shell underneath. A reptile's skin is fundamentally different from a person's, because it doesn't always stretch to accommodate growth. This means that as a reptile grows, he outgrows his skin in stages, shedding it and leaving it behind. This is perhaps most recognizable in a snake, who sheds his skin in one giant piece. 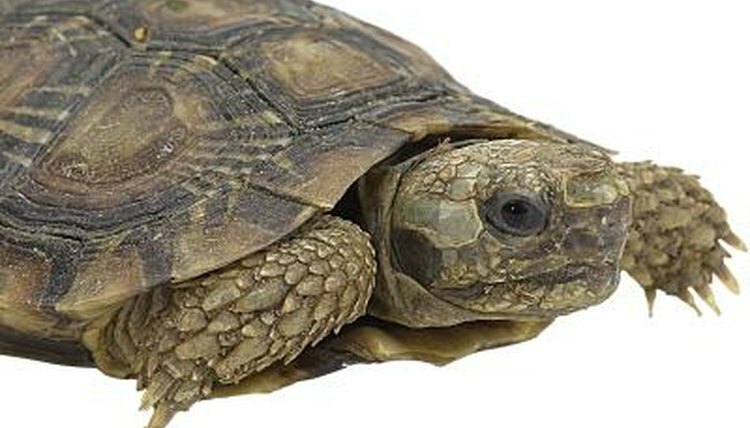 Other animals, including certain turtles, shed their skin in small, irregular pieces. Not all turtles shed their soft skin, but it's more common in aquatic turtles, partially as a way to stave off infections. Much more common than skin-shedding is scute-shedding, a process in which the turtle's shell scutes peel and flake off to be replaced by new ones. This is partially a response to normal growth, as the shell has to expand along with the rest of the body. Even grown turtles shed their scutes, though, particularly ones that spend a significant amount of time in the water. Shedding the scutes piece by piece rids the turtle of shell rot and parasitic infections that can occur as a result of being too much in water. If you have a pet turtle who loves the water, you need to be mindful when his shell starts to shed. Shell rot is a condition that occurs when a turtle spends too much time in the water and not enough on dry land, preventing his shell from periodically drying out and causing unnatural infection, erosion and shedding. Consult with your vet to determine how much time your species of turtle should spend outside of the water, and if need be, separate him from the water accordingly so that his shell dries out. What Does It Mean When Your Turtle Hisses?